March | 2012 | What? Well I went and took a couple of pictures of my new fan, which I put together with very little help :). I love it when I can do that. 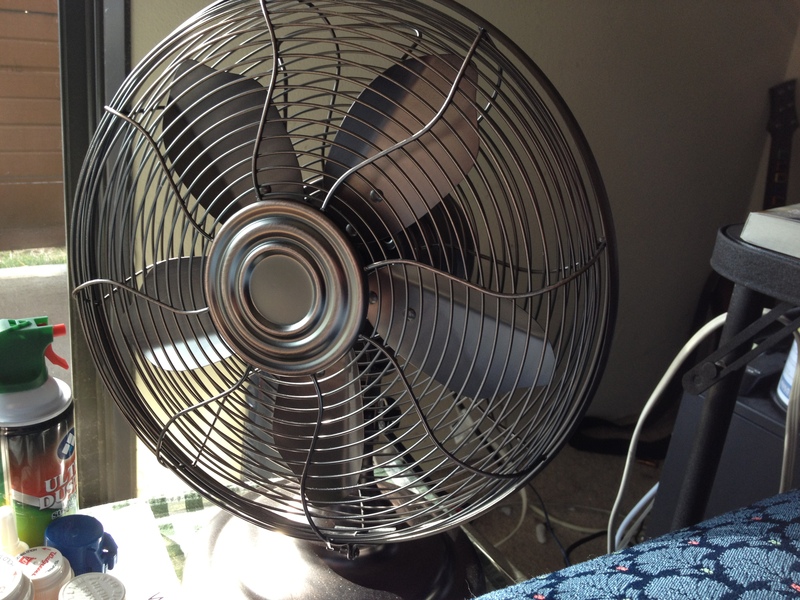 I’ll just post one picture of the fan :). My last fan I had bit the dust over a year ago. It was a standing Oscillating Fan, where this one is a desk top fan :). It’s also all metal, which is better then the all plastic ones out there :). This little fan is definitely doing it’s job, and I love it! This will also help me deal with the summer heat, cause I don’t want to always run the AC since I’ve moved to Colorado. Now when I lived in Arkansas, there was no way in hell that we could survive the summer without the AC’s running. The humidity down there was horrible along with the awful heat indexes! Ugh, talk about no sooner you step outside your clothes stick to your body cause of the instant sweat that gathers on your skin just from the humidity alone. Also it don’t help much when your temps get into the 100s down there, and then add in the heat indexes over 100. EW! Anyways, I’m very happy to be living in Colorado because there is like NO humidity. It’s dry and very comfortable, though you can see the dry air affect on your skin, that’s what moisturizing lotion is for :). I’ll take this over humidity any day, but sadly I’ll have to deal with some humidity when I go visit family cause they live in Illinois and Arkansas. I’ll suffer the humidity just to see my family and loved ones :). Well today is a very windy and gusty day in Denver, CO. It is causing issues with fires and with the power around certain areas, so there are going to be brownouts and blackouts from time to time. So far, my sister has been having brownouts, while the radio station I’m listening too has lost power twice in less then 5 minutes. Yep Mother Nature is having a hay day with everyone here in Denver. Thankfully it hasn’t happened to my area yet, but ours might be less do to our power lines and such being buried under ground. The weather is very beautiful here today with it being 80 degrees outside. It’s wonderful and relaxing, at least for me, but not for those who will most likely have to be out and about taking care of forest fires, wild fires and grass fires. We do need some rain though cause it’s getting very parched out there moisture wise. I just wish La Nina would just go away, but we already know we can’t stop these cycles from happening. 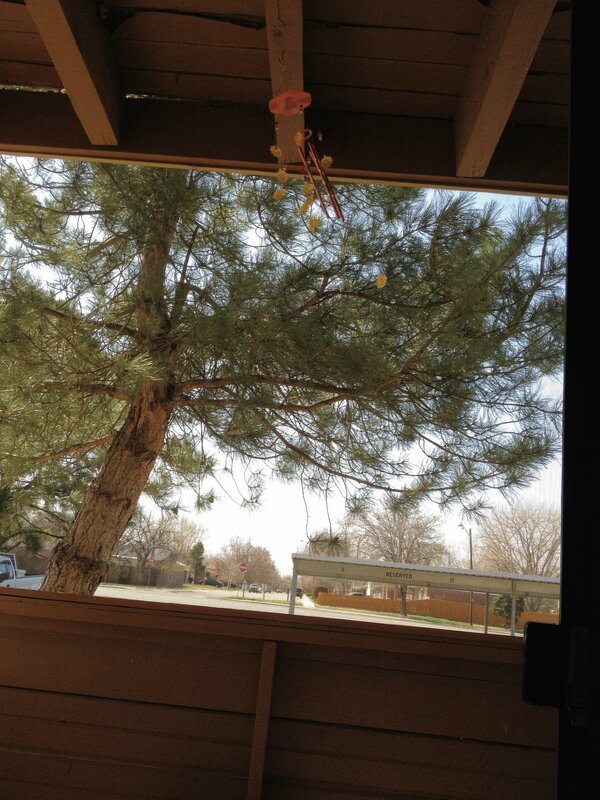 This is a picture of what the wind is doing outside the patio door. It’s blowing pretty hard out there. I’m think today here in Denver cold almost put the “Windy City” to shame over in Illinois :). People are enjoying this day though, I’m seeing lots of people on their bikes and walking instead of driving, but this usually does happen here in Colorado during the Spring, Summer and Fall seasons :). I can’t wait to be able to take a break on an actual weekend and go driving up in the mountains just to look around and enjoy the beauty that is Colorado and the Rocky Mountains. Enjoy and I’ll be putting up more posts with pictures in it :). Well lets just say this, Tebow is being traded, first it was to the Jets until the Jets discovered a slight clause in his contract that they would have to pay him 5 million dollars, now they’ve decided NOT to take on Tebow and have stepped back. Now Jacksonville is back in the running and they REALLY REALLY want him, and I hope that they do get him, cause that would be his home stomping grounds, and I think he will do Jacksonville proud! Go Tebow! I’d love to see a Bronco and Jaguars game and see who does better. Tebow has a lot of potential within him if people will just give him time and help him reach that potential. Who ever gets Tebow has so much more potential to reach the Super Bowl then some do. Yeah Manning is good, but gee don’t get me wrong, the man is 36, was out of football for a whole YEAR and has gone through 4 neck surgeries, but that don’t mean he is up to his power house self that he was when he first started playing for the NFL, but best of luck anyways and it will be the Broncos loss and Elway’s failure if Manning gets hurt and can no longer play. I will continue to be a fan of Tim Tebow, because he has talent, he is worth it and is a good man and a good role model. Whoever gets Tim Tebow will have a horde of fans to help them along the way, and I’ve got a gut instinct that Tebow will hit the Super Bowl and when he does the Broncos will see what they lost, and I’m not going to feel sorry for them. They picked, they traded, they made their bed and they’ll have to sleep in it! Good luck to you Tim Tebow, and know that you have a ton of fans out there that will support you and be there to watch you. God Bless and I hope the Jaguars will get you :). You will be missed here in Denver by your many fans, but the haters out there are way to far happy that you are gone, cause they can’t see your potential like many of us can.